Presented by Dwight Trible, Executive Director The 'new' World STAGE Art, Education & Performance Gallery non-profit 501(c)(3) Incl. Master of Ceremony - Jeffrey Winston, Jazz philanthropic-herstorian or "The Biggest Voice in-the-World" Matt Gibson @ no extra charge ¿TBD? + incl. Joshua White - piano & Guillermo Brown - drums. @ TWS "of course" - O-! Fri. Aug. 17 -- Jeff Parker, Vinny Golia & Alex Cline -- you could hardly ask for a more perfect triangle of guitar-woodwinds-drums atmosphere and avantitude, bolstered by the driving bass of Michael Alvidrez. At the World Stage, 4321 Degnan Blvd., Leimert Park 90008; 9pm (two sets); $20; www.theworldstage.org. 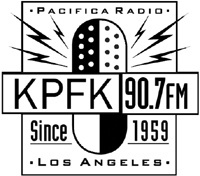 Friday 8/17 9:00PM – Jeff Parker/Vinny Golia/Alex Cline(/Michael Alvidrez) – The World Stage – South L.A.
(as mentioned) [LIVE On Air] by 2nd Sun. of the month Host, Ollie Bivins " Just a headz-up, always something happening @ The World Stage, it's a trio date w/ 'Parker, Golia & Cline', a really special performance coming-up "
"Big THX For: _ video" - O-! Wuz-Hot?! Weekly Best Bet 4 Live Jazz in L.A.
Friday 4/27 – Guitarist Jeff Parker is at The World Stage in south L.A. with saxophonist Vinny Golia and drummer Alex Cline.